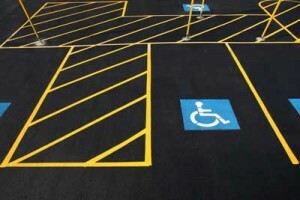 The Americans with Disabilities Act Accessibility Guidelines (ADAAG) clearly states that when striping or restriping your commercial parking lot, you must ensure you are striping spaces that meet its stringent accessibility guidelines. This means that the number of striped accessible parking spots and van accessible spots must be in the designated proportion to the amount of striped traditional spaces as dictated by the ADAAG. On average, one parking spot must be accessible for every six to eight parking spots. The number of accessible parking spaces that your commercial or privately owned business must provide is also dependent on several factors including the type of business, number of total parking spaces, and the location of your business. To accomplish this, it is important to hire an ADA Paving Contractor. When it comes to marking ADA compliant parking lots, ADAAG specifications must be carefully followed. It is important to remember that the federal ADA guidelines may differ from state and local laws thus, you must follow federal, state, and local laws for marking your commercial or privately owned parking lot to be sure you are in compliance with the law. If you are in need of ADA Paving Contractors that are seasoned in ADA Handicap Parking Lot Paving for the Portland, Beaverton, Tualatin, and Gresham, OR areas look no further as Hal’s Construction is here to serve you. Our trusted and reputable ADA Contractors are familiar with federal, state, and local ADAAG regulations and can guarantee that when you choose Hal’s Construction for ADA Handicap Parking Lot Paving you will be 100% in compliance with the law. Marking access aisles is an important aspect of ADA compliance in parking lots as they must be located adjacent to accessible parking spots. Access aisles markings are clear in the designated specifications and Hal’s Construction has ADA Contractors familiar with the Americans with Disabilities Act Accessibility Guidelines (ADAAG) for accessible parking lot markings. You should always take ADAAG seriously, and make it a priority to ensure your parking lot is not only in compliance in the law, but more importantly accessible to those that require additional accommodations. The installation of accessible parking lot ramps is one modification that the Department of Justice has deemed readily achievable, which means if your business does not already have accessible parking lot ramps now is the time to call Hal’s Construction. ADA ramps must be present where parking lots exist. Proper installation of ramps during ADA Handicap Parking Lot Paving services is best left to confident and seasoned ADA Paving Contractors. Businesses in the Portland, Gresham, Tualatin, and Beaverton areas can count on Hal’s Construction to give it to you straight and provide you with a thorough assessment of where your business stands in terms of The Americans with Disabilities Act Accessibility Guidelines (ADAAG). We proudly offer sound and highly sought after accessibility ramp installation for parking lots across the Rose City. We understand that running a business has many responsibilities and obligations. Let Hal’s Construction take the burden of ADA compliance off your shoulders and allow our trusted ADA Paving Contractors to do what they do best. The ADA specifies that all newly constructed or altered parking lots must contain curb ramps for persons with disabilities. 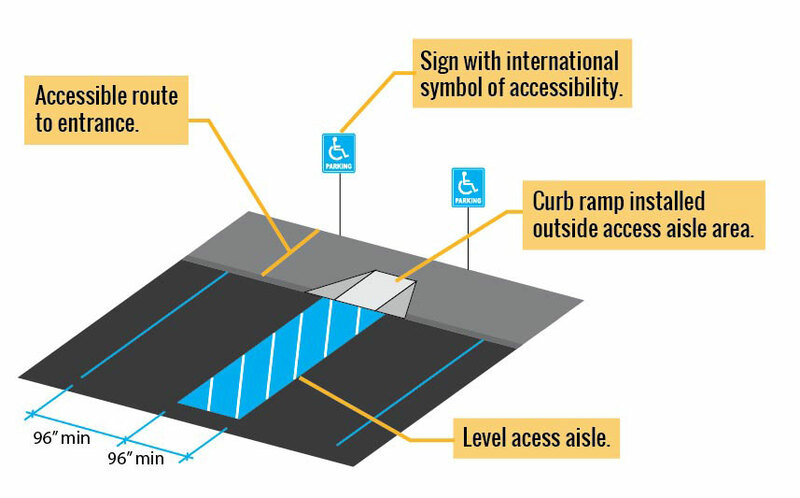 Furthermore, exterior pedestrian ramps must also be constructed if needed for an accessible path of travel from the parking space to the entrance of the business or facility. Making curb cuts in sidewalks with a minimum width of 5’ is a modification that the Department of Justice considers readily achievable for businesses and as such should be a priority for new construction and existing facilities. Accessible sidewalks are defined as 5’ or wider with the exception of existing sidewalks. Sidewalks and walkways must also be slip resistant to be in compliance. Additionally, sidewalk slopes should be at 2.0% or less. Hal’s Construction will help your commercial or privately owned business comply with sidewalk and walkway ADA regulations at a competitive price in the Portland, Beaverton, Tualatin, and Gresham, OR areas. It is our goal to keep your business in ADA compliance while providing superior quality ADA Handicap Parking Lot Paving from seasoned ADA Paving Contractors. We are happy to provide ADA sidewalk and walkway services for new construction and existing facilities. For new construction, we will design a parking lot that is not only comfortably accessible for those with disabilities, but one that looks sleek and professional. For existing facilities, we will conduct a thorough assessment to determine what modifications are considered readily achievable then prioritize those modifications based on price and importance. ADA signage must have the International Symbol of Accessibility (ISA) and be mounted high enough to be seen while a vehicle is parked in the space. Van accessible parking spaces must have signage that indicates it is van accessible. The only exception to ADA parking lot signage is if the parking lot has only four spots or less. In the case of a business having four parking spots or less, ADA signage is not required by The Americans with Disabilities Act Accessibility Guidelines (ADAAG). Parking lots with four spaces or less must still provide accessible parking for those with disabilities. State and local regulations for signage may be different from federal guidelines thus should be paid attention to carefully when ADA Handicap Parking Lot Paving occurs in the Portland, Beaverton, Tualatin, and Gresham, OR areas. When it comes to ADA Handicap Parking Lot Paving you can trust the ADA Paving Contractors with Hal’s Construction. We know the federal, state, and local regulations for ADA compliance and you can rely on us to get the job done right. Hal’s Construction won’t allow your business to be a target of an ADA lawsuit when you choose us to serve your ADA compliance and ADA Handicap Parking Lot Paving Signage needs. All public commercial parking lots must provide parking access for those with disabilities. If your business is privately owned yet serves the public, you are required to actively remove any access barriers for those with disabilities that is deemed readily achievable by the ADA. Accessible parking spots must be located as close to the business entrance as possible with adjacent access aisles. There must also be an accessible route from the parking space to the entrance of the building or facility. For facilities with multiple entrances, there must be accessible spaces nearby for each entrance. Access aisles may serve two accessible parking spots. The IRS may offer you tax credits for actively removing barriers considered readily achievable by the Department of Justice. If you are unsure of how to provide the parking access for those with disabilities call Hal’s Construction. We will guide you on how to prioritize ADA Paving and ADA Handicap Parking Lot Paving so you stay in compliance without breaking the bank. Our competent ADA Paving Contractors will conduct a thorough inspection of your parking lot and provide recommendations for work prioritized by importance. Hal’s Construction is here to provide the Portland, Beaverton, Tualatin, and Gresham, OR areas with the highest quality ADA Handicap Parking Lot Paving services that will keep you in compliance and provide vital parking access to those that need it most.